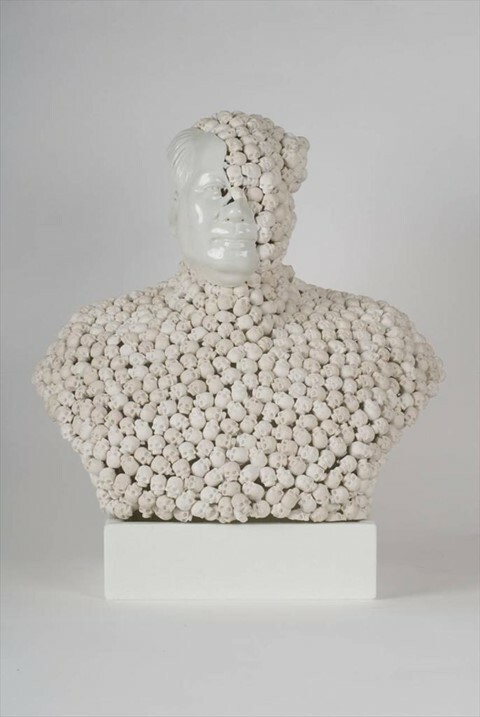 Bouke De Vries is an artist whose work deals in history and imperfection, employing a surrealist and oftentimes self-deprecating aesthetic to deconstruct traditional forms of sculpture, such as marble busts, in order to make us reconsider our notions of beauty. During Frieze week, the artist shows in Vanitas: The Transcience of Earthly Pleasures, a group show curated by Joe La Placa and Mark Sanders that explores the temporality of existence. Here, the artist talks to AnOther about the piece he has in the exhibition, Skull Face Mao, and explains why the one thing we need more than ever in society is art... sic transit gloria mundi. "I feel like the medium of sculpture chose me because my artwork grew from my work as a ceramics conservator, except I deconstruct rather then reconstruct, giving new life to the discarded and the rejected. The Skull Face Mao in the Vanitas show is inspired by the harrowing biography of Mao Zedong by Jung Chang and John Holliday. He is the only 20th century dictator who is still un-toppled despite being the one who was responsible for more millions of deaths of his own people than all the others put together. My Mao series uses 1960s Cultural Revolution cult-of-personality porcelain busts and statues. I made thousands of hand-made porcelain skulls to represent the nameless millions who died because of his whims. It’s interesting to learn that at the height of the Cultural Revolution there were more busts and portraits of Mao then there were people in China. The skulls also remind us that we too will die. Alas poor us, alas poor them... vanity of vanities. Of course we all turn to dust in the end, but earthly pleasures kick against this inevitability. Art is one way in which we can outlive our own mortality, it lives on after us. Despite having been brought up a good Catholic boy, I can’t say I still ‘believe’. I think different artists play different roles, some revel in the physical joy of being, others wallow in the physical pain and mental anguish of being. These are the underlying Yin and Yang of art, sometimes you’ve just got to laugh. My own work often comes out of me fully formed, perhaps because I’ve been pondering these matters many years with no expression. Suddenly I found a way to express them, and there seems to be an unstoppable flow. Humour is often a mask behind which lies the truth. Art helps you face the truth about the world, and about yourself... God knows we need it."